Thinking of Going Caching as just another Mega would be a huge mistake. It is, in reality, a super long weekend of awesome geocaching events and activities. Having said that, one of the events of that weekend is an official Mega event. This post covers the details of that event. 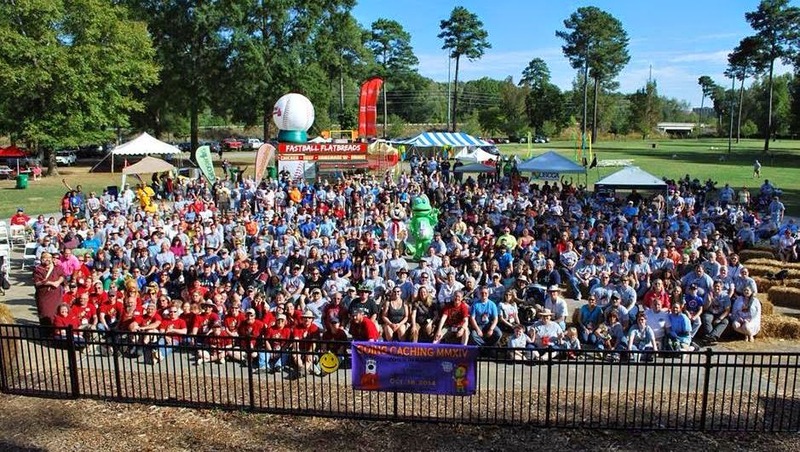 The event happened in Ridge Ferry Park in Rome Georgia on Saturday October 18, 2014. The weather was 70s, and sunny. One couldn't ask for a better day. With Going Caching there is always more going on that meets the eye, and there is always something odd and unique going on. Having said that, this event had many of the standard things found at any Mega event I have ever been too. For example, there were many vendors selling geocaching related merchandise. The Georgia Geocaching Association hosted Geo-Bingo. The card is 20 squares with various descriptions in it i.e. "Has 10,000 finds", "Has only been caching for a year", "Has cached in a foreign country", etc. The idea is to talk to other geocachers to find folks who match the descriptions, and if they do, get them to sign a square. Once all 20 squares are full, the cacher is entered into a drawing. It only took me 30 minutes to fill my card. The log was a nicely done scroll, which fit into the Roman theme quite nicely. I got an action shot of Yours Truly signing it. There was a silent auction, featuring custom made geocaches. The caches were judged by Jeremy Irish (of Groundspeak fame), and the winner got a prize. I won the middle spaceship cache in the auction. 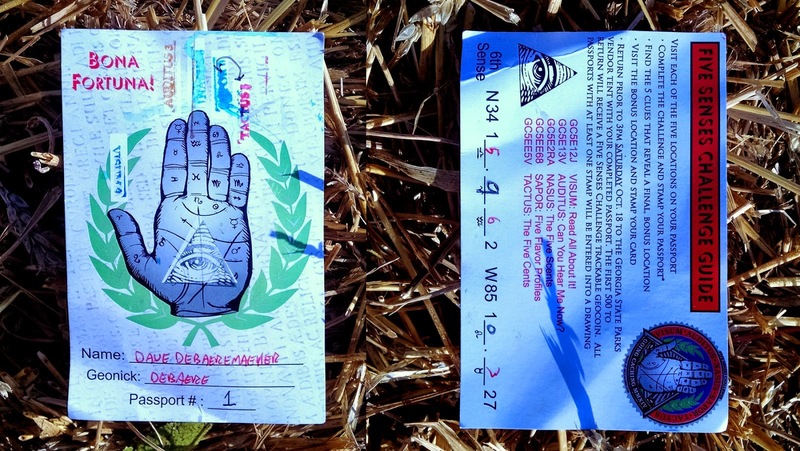 Going Caching is famous for its creative caches, and this year was no exception. This year had the Five Senses challenge. The challenge involved finding and solving 5 in-field puzzle caches themed after the five human senses: sight, sound, taste, touch, smell. Each cache has a stamp, that is recorded on a passport. Once one has all 5 stamps, one can solve a puzzle on the passport which leads them to a 6th cache. The 6th cache was actually on the main stage at the Mega event. It involved going thru 4 rooms. Each room required one to solve a puzzle to get thru to the next. It required team work. Once the 4th room was accessed one got a 6th stamp, for the passport. The completed passport could be traded in for a geocoin. These are pics from the rooms. The first 5 caches are published caches so I won't describe them. The 6th was temporary, so I can give more details without giving spoilers. The first room had a series of lights, and a throne. To get through, several people (to get over 400lbs) had to sit on the throne. When they did some of the lights went out. These lights led to the code to the exit door, and the next room. The next room was glowing with blacklight. The walls were covered with glowing numbers and stars. Around the room had a bunch of doorbells. All 5 doorbells had to be pressed at the same time, which caused a laser to shine on one of the numbers, revealing the code for the exit door. The third room had a bowl of golf balls, and a series of holes in the wall. One had to put the balls in the top row of holes, and watch which holes at the bottom the ball came out of. Each hole was coded, and the order led to the exit code. The final room had the stamp for the passport. So my day was filled with a lot of fun activities. At the end of the day we all gathered for a group photo. I am in the back row, right in front of the brown awning on the left side. So that was the Mega event in a nutshell, except... well... remember when I said there was always something else going on? The Mega event had a whole other activity going on I haven't mentioned yet. I left a couple clues in the previous post, however to get the true answer you'll have to wait until the next post. Ain't I evil?